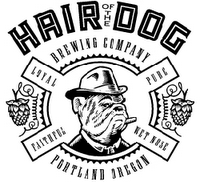 Hair of the Dog will be celebrating their 13th Anniversary on Saturday, November 11 from 10 am to 4 pm. Says Brewer Alan Sprints: "I will be releasing 2006 Doggie Claws and some Fred from the wood from this years bottling. Hope to see you here." Be there or be without beer. Continuing along with our exploration of winter ales, here are three more home-grown offerings. 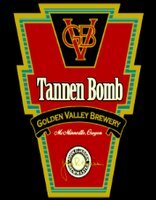 When I first encountered Tannen Bomb in 1998, Golden Valley was having a little trouble with its yeast. Something in the process produced excess diacetyl, which actually made for quite a beer. It was ultra silky and butterscotchy, and you could gobble down a pint without recognizing it was 8% alcohol ... and thus did you get (Tannen) bombed. The brewery has gotten things under control, and now Tannen Bomb is a more complex ale and not nearly so stealthy (probably good). It is about the color of maple syrup, and only just slightly less thick. The main aromatic note is alcohol--it smells big. Golden Valley calls it a strong ale, but it also tastes big, with the body and alcohol of a barleywine. It could do with a month or two of age, when the roasted malts, alcohol, and hops blend more fluidly together. But even at this stage, it's quite nice. Sally keeps sneaking over for sly sips as I write this. Hops: Chinook, Liberty, Fuggles, alcohol:8.0% abv, bitterness units: 50, Rating: Good. Full Sail's venerable winter ale has been brewed since 1988, and--full disclosure--it's long been my favorite. It's another one of the beers that is released too early, and which I buy too early, with delight. 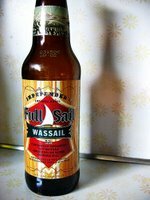 As evidence of how things have changed, it appears the recipe is now fixed (Full Sail gives very little data about what's in their beers, though they used to give all the details.) Until a few years ago, however, they would mix it up every year, using different hops, slightly differing malts--just to shake things up. I guess we've come to a "mature" phase where that kind of variability is no longer considered good business. Wassail is a deep brown, almost tending toward porter dark. It has a pronounced roasted aroma, a bit like fresh toast. The flavor is a deep, resonant mixture, the dark malts blending with the hops for a dark, satisfying winter warmer. It also has a sweet quality somewhat akin to Cola or chocolate, drawn out by the very dry, bitter finish. In fact, that's not a bad comparison--it's liquid version of very dark, artisinal chocolate. Rich and decadent. The version on shelves now is, like Jubel, a little green, and I'll have to do a fuller review in a couple months. Another incomplete. This is a beautiful red ale, and it packs a potent citrus candy aroma. I've been brewing with Chinook hops lately, and it has a particular quality of citrus that I recognized instantly in this beer. I imagine a lot of people will love this beer, and it reminds me of Sierra Nevada Celebration--a reddish ale (more copperish) made with Centennial and Chinooks, like Santa's PR. And, for the same reason I don't like Celebration, I can't fall for Santy. It's too thin, and the hops, even at 44 IBUs, overwhelm it. I also don't feel the warming glow I like from a nice winter ale. It's an icy, sharp beer. If you like Celebration, you'll probably like this beer. I don't. Malt: two-row Harrington, Klages, Munich, Hops: Chinook, Centennial and a "mystery hop", original gravity: 13° Plato, bitterness units: 44, Rating: average. Mule Kick Oatmeal Stout, Confluence Amber Wheat and Pilot House Imperial Pilsner sound like good, localized names for craft beers. But these beers aren't produced by some microbrewery at a local pub. They're brought to you by the nation's largest brewer. In its effort to tap into the popular and growing craft beer category, Anheuser-Busch Companies Inc. is going regional - even local. By combining flavor and marketing cues from craft brewers with Anheuser-Busch's purchasing power, marketing expertise and distribution network, brewery President August Busch IV and his team could soon pose a significant new challenge to smaller craft brewers with specialty beers of their own, analysts said. I can't imagine that this will work--it seems to me that one of the reasons we drink local beer is, well, because it's local. This seems like one of those good ideas in the corporate board room, not so much in the marketplace. But maybe I'm wrong--maybe the rest of the country isn't as parochial as Oregon. There is no actual, or sole, "winter warmer" style. Breweries have wide latitude this one season each year to create a truly unique beer. Broadly speaking, these beers should be strong and robust, providing enough flavor and alcohol to warm your core. But whether that's a doppelbock, a strong ale, a stout, or something without category--that's the brewery's choice. We've had an ongoing discussion on Beervana about the characteristics of the "Northwest style," and I think you can see it clearly around this time of year. Oregon (and Washington) breweries tend to go to dark malts and rich complexity. Although hops are celebrated, almost without exception these beers resist the label of "out of balance" or "overly hoppy." In many ways, I think they represent the truest passions of the brewers who make them. This beer is aiming for something greater than it actually achieves. 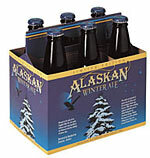 Brewed in the style of an old ale, Alaskan adds the tips of Sitka Spruce for character. It is amber, rather on the pale side, with a very light (and quickly-evaporating head). I got a sweet caramel nose that may have had a note of diacetyl and also may have had a bit of spruce, but both were rather shadowy. The flavor of the beer is likewise subdued--mellow and sweet, with a butterscotch candy palate and a mild pineyness that may have come from the spruce. I also thought I detected a mint quality which I retrospectively identify as spruce. The sum is not quite the promise of the parts. I'd like a little more of everything--maltiness, hops, and spruce. Call it an interesting experiment that needs to be taken an iteration further. Malts: pale, wheat, Munich and caramelized malts, hops: Saaz, alcohol:6.4% abv, original gravity: 1.066; bitterness units: 27. Rating: Average. Here's an interesting factoid: Jubel was the first beer Deschutes ever bottled, a fact about which I was until recently ignorant. Despite this, the brewery seems inevitably to always brew it late and/or release it early, so when I buy my first early-October bottle, it's green and not indicative of the beer will become. And again, as constant as the seasons, the pattern repeated--the beer's too green, but I'm still buying it in October. What I can tell you is that it's a beautiful chestnut, full of roasty malt aroma and garlanded with a delicious peppery hop. The hops and alcohol currently overwhelm the smoothness of the malt, but give it time. This is typically one of the creamiest and smoothest of the big winter ales, so let's give it an incomplete. Alcohol:6.7% abv, bitterness units: 60. Tawny amber, very bright--looks a lot like an Oktoberfest. Comforting fresh-bread aroma, with a touch of black pepper and cola-like sweetness. I recall this being a slightly harsh, thin-bodied beer, but the 2006 incarnation is neither. It's a mellow, creamy, candyish ale with a slightly piney, spicy hopping. Some winter ales are a little like a brandy, with a sharper alcohol edge, while others are like hot toddies. Put Ebenezer in that last category. 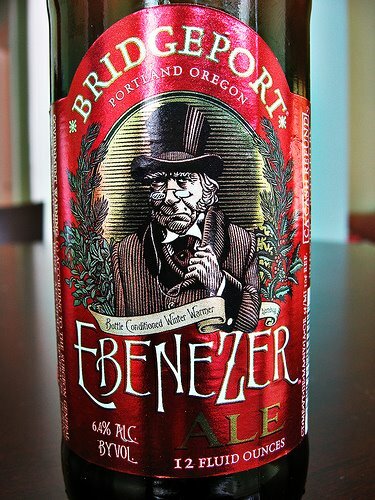 As with the Alaskan, I'd like a little more oomph, but Ebenezer has its charms. Alcohol: 6.4% abv, original gravity: 16° Plato; Bitterness Units: 40. Rating: Good. Extremely aromatic, rich with green, citrusy Cascades. No mention by the brewery that it's dry-hopped, but I wouldn't bet against it. This incarnation of Winterhook is a strangely summery beer, with a bright, layered hopping that comes off fruity and mild. It must be a new recipe--I recall an older version of Winterhook (it was actually one of the first winter warmers) that was darker and more vibrant. A recurrent criticism I have with Redhook is similar to Portland Brewing--their beers are far too safe. This is a pleasant and polite beer, the kind you'd take home to someone's mother. But it isn't a hearty ale that could beat back the frost. Even the stats tell the tale--5.5% abv/28 IBUs. I definitely wouldn't turn one down--a beer with this kind of hop aroma is a keeper--but I'd hate to be stuck at a December Seahawks game with nothing more than Winterhook to protect me from the elements. Malts: English caramel and Munich, hops: Cascade, Northern Brewer, alcohol:5.5% abv, original gravity: 1.053; Bitterness Units: 28, Rating: Good. Our No. 2 beer, Smoked Porter from Captain Lawrence, sounds like one of those brewing experiments, but the company, in Pleasantville, N.Y., insists that it is not. In the blind tasting, I was sure our No. 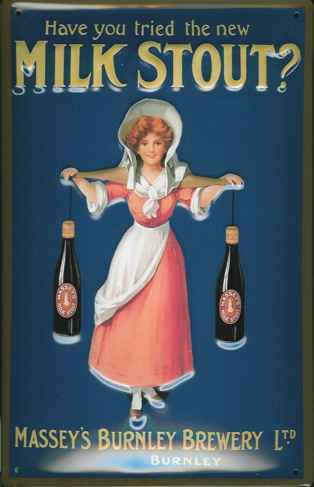 3 beer was American because of its powerful, assertive flavors of coffee, licorice and chocolate, but it turned out to be from Fuller’s, one of Britain’s leading breweries. By contrast, Mocha Porter from Rogue Ales in Newport, Ore., did not make the top 10 because the hop aromas drowned out everything else. The Times offers ratings for beers, from 1-4, but none of the beers they tasted did better than a three-star ratiing. Geary's, their fave (and a fantastic beer), got three. It begs the question: what does it take to get a four-star rating? Being a nice chardonnay? Makes me think I need to do a porter tasting right quick. Roger Protz, in his nice book on stouts, has a couple of great quotes to demonstrate how early milk stouts were marketed. "Make Stout More Nourishing! That was the aime of Mackeson & Co. when after a long period of exhaustive research in conjunction with one of the leading analytical food chemists, they were to produce a beverage containing nature's best food, scientificially and carefully introduced." The "nutritional stout" phase continued for decades, but ultimately began to marginalize stouts as a medicinal drink. They became associated with grandmothers who offered them to stave off the winter flu. Mackeson survived, but mostly milk stouts died off. Milk stouts don't actually employ milk, but rather lactose. Unlike most sugars, however, lactose can't be broken down by beer yeast, and remains unfermented, as calories and carbohydrates. It gives the beer a unique sweetness and silkiness on the tongue that does in fact suggest milk. It's not so much a flavor as a quality. Cream ales, the light summer alternative, often also employ lactose (and never cream). Widmer's milk stout has a fascinating story behind it. Nearly ten years ago, the brewery embarked on a program with local homebrewers to produce little known-beer styles. The Brothers work with the homebrewers to come up with a style, and then the homebrewers have a competition to find the best example. It's brewed at the brewery and sold on tap at area pubs. The very first Collaborator beer was this milk stout, and it remains, to my knowledge, the only style to have made it into the bottle. Although it looks black in the glass, if you tilt the beer and hold it up to light, you see that Snow Plow is not opaque, like many stouts. Lactose is reputed to make heads thick and long-lasting, but I kept getting a rather meager mocha skiff--though it was very dense and creamy. It's interesting that this style has slipped off the radar because it's a real crowd-pleaser. It's completely likeable--I can't imagine anyone not enjoying this beer. The palate is largely sweet and creamy, bordering on decadant, but there are hints of roasty malt and a breath of hop at the end. It isn't a burly stout, but it has enough body to satisfy big-stout lovers; on the other hand, it's modest alcohol content makes it a great winter session. Oregon is rightly famous for our hoppy beers, but dark beers are an unheralded fave. Perhaps it's the rainy skies, but a lot of people love stouts and porters--some drink them exclusively, even through the summer heat waves. Brewers oblige this preference, and we have a number of great dark beers. But for milk stouts, you have to go to Widmer. A couple of weeks ago, my eagle-eyed spouse pointed out that there was a new resident at the corner of NE 18th and Broadway--the Broadway Grill and Brewery. * Its provenance was obscure, but the "brewery" in the title was enough to lure us in. 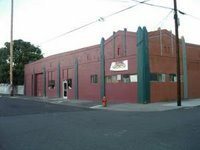 Turns out it is actually an Eastside branch of The Old Market Pub and Brewery, which has resided in Multnomah Village for a dozen or more years. The space is quite comfortable--and had already attracted a pretty good crowd when we visited a little over a week ago. The front of the pub curls around a groovy bar, and there are open spaces in the back festooned with large, flat-screen TVs (tuned to a Bears game when I was there). They both suit the sports fan but remain comfortably out of the way for non-fans. At the end of the review, I'll copy in a minute of footage I shot at the pub so you can get a sense of the space. While I'll appreciate further reports (and learn more on further visits), the food seems like good, if somewhat predictable, fare. I had a honey mustard chicken sandwich that was perfectly cooked, moist, and tender. Sally had pizza, which turned out to be thick crust--not to my personal taste. However, it is hand made and seemed like it might have been made with beer and is pretty tasty, particularly loaded, as it was, with tasty veggies. The pub offers a sampler plate with nine 4-ounce glasses of beer for $9--a great value. I won't go for it every time, but I might do it every now and again, as the seasonals rotate through. On the whole, it was an impressive selection. Except for a diacetyl note in a couple of the beers that I think was intentional, none had any off-flavors. Only a couple were so-so, and three were worth going out of your way for. Definitely an above-average range. The Broadway area has always been a little light on the brewpubs--just a McMenamins a few blocks down--so I think this will become a regular watering hole for locals. Please use the comments to let me know what you thought of the place. *I'll get contact info soon. At long last, I have digitized copies of a bunch of archival Henry Weinhard material--including commercials, documentaries, and random errata. There's so much of it that I won't be able to post it all, but I'll give you a sample. This is one of the more famous ads from the 1970s, about the fictitious Schludwiller brewery from California. It has extra resonance for Oregonians, because it was during a time when the state was particularly agressive toward California immigration. Oregon's most famous and beloved Governor, Tom McCall, exhorted non-Oregonians to visit but "please don't stay." Bumper stickers read "Don't Californicate Oregon." Webfeet have always distrusted Golden Staters, but this was the most fervent period. For those of you with an interest in the business of beer, The Oregonian has an article describing the politics of lobbyist Paul Romain and the clout of distributorships in the state. Romain got a little unwanted press last week when the O reported on a Hawaiian luau Romain threw for a number of Oregon legislators--in Maui--which went unreported by the pork-fed pols. It doesn't tell the whole story--and particularly not the role of smaller craft brewers in the state--but there are some good bits of context. The Hawaii trips are just part of the group's influence strategy. Since 2002, the distributors have showered $1.2 million on lawmakers through lobbying and campaign giving, The Oregonian found, with much of the latter going to legislative leaders and committee chairmen who have the power to pass or kill bills. Distributors have consolidated in recent years. Among the Oregon association's 19 members are some of the largest wholesalers. They owe their commercial niche to post-Prohibition reforms that split the alcohol trade into three tiers -- producers, distributors and retailers -- so gangsters could no longer infiltrate the entire supply chain. 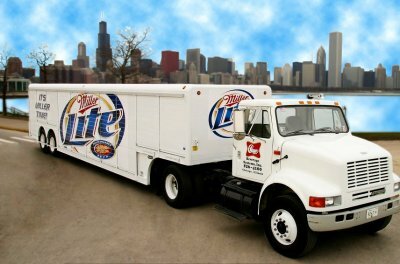 In 1981, lawmakers also gave distributors exclusive rights to sell individual beer brands in their delivery territory. A tavern in a given area of Southeast Portland can buy Pabst only from Mt. Hood Beverage, for example, and Coors and Corona only from another distributor. Romain cemented his influence in 1989, when he negotiated with big brewers to write the law that governs Oregon's beer trade -- the statute that, among other things, makes it difficult for producers to dismiss a distributor. He takes credit for getting many of the contractual terms between distributors and suppliers enshrined in the law. And, although the article doesn't mention it, law prevents small brewers from self-distributing, but in many cases, they're too small to attract the attention of distributors. 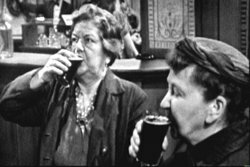 Hair of the Dog, notably, was stymied early in their existence because their small volume was ignored by local distributors. And in other parts of the state, distributors may have a monopoly, so small breweries have no alternatives for distribution. Much could be writ, but perhaps we'll just watch the story and see how it develops. The United States produces 24 percent of the world's hops, and about three-fourths of the U.S. crop comes from the Yakima Valley. Hops were a $77 million crop in Washington state in 2004. More than 40 families grow hops in the valley, which is dotted with orchards, vineyards and farms. The fire destroyed or ruined about 10,000 bales, each weighing about 200 pounds (90 kilograms) and likely worth $1.75 to $2 a pound, Ann George, administrator of the Washington Hops Commission in nearby Moxee, told the Herald-Republic. I wonder if it smelled like ganja in Seattle. "Flavoring in beer and ale"--oy! I think I could get by on two or three bales this year, in a pinch. Maybe the crop was mainly for use in macropilsners--how could you tell if they used fewer hops in Bud Light anyway? Rest in peace, wee hops--we never tasted ye. GABF - Oregon Screwed Again! Yeah, Oregon and Washington together have less world-class beers than Colorado. And George W. Bush is one of the great presidents of American history. However, due props to those that did manage to get beyond the obviously untutored palates of the "judging" staff--you must stand in the stead of the rest of Oregon's great brewers! 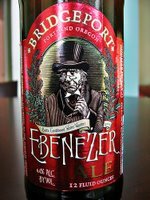 Oregon should have its own awards: the Beervana awards for transcendent ales. Now that would be a mighty honor. I went to the newly-opened Broadway Brewery and Grill last night. It's a satellite of Old Market Pub and Brewery in Multnomah Village--but far handier to access for Eastsiders at its 18th and NE Broadway locale. I will get to a review at some point, but here's a little video in the meantime. And anyway, can't you tell, just by looking, whether a beer's good or not?